Maak je reis naar Providenciales zorgeloos! Laat ons uw retourtransport tussen Providenciales International Airport en uw Providenciales-accommodaties afhandelen. We zullen er zijn om u te begroeten bij aankomst in een voertuig met airconditioning en zullen u comfortabel terugbrengen naar de luchthaven wanneer het tijd is voor uw vertrek zodat u vrij kunt genieten van de zon en de zee! Booked this transfer and it was very smooth, air conditioned, and comfortable. Shuttle was both available on time to take us from Providenciales International Airport to our hotel and back. It is definitely a bargain as everything is Turks is pretty pricey. 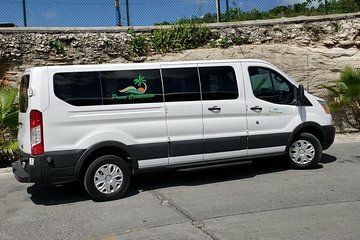 Also, shout out to both of our drivers Brooke arrival driver and Ian departure driver as they were great and very nice in pointing out all the wonderful things Turks and Caicos has to offer! This was about as easy as it can be while traveling. Outside of the airport is an information podium and the staff there directed us to our Viator transportation. We had the shared ride so we waited about 10 minutes and then were on our way. The van was clean and comfortable. We arrived at our resort in about 10 minutes relaxed and ready for our vacation. The driver explained to us the procedure for our departure and made sure we were clear on the instructions. We had to notify them a day in advance of our departure, which we did , and they arrived promptly for our return to the airport. Prompt pick up. Helpful and courteous driver. Pick up very on time, very fast and good service. I highly recommend this service. On time which is most important to me. Friendly. They were on time for both pickups and easy to communicate with. It is a savings if you book this in advance opposed to using the taxi services around the island. On time and great staff. Would highly recommend.